The ending of this classic story can still bring tears to my eyes - Bobbie's cry is perfectly heart-audible. It was one of my favourite books as a kid; I can't remember when my mother read it to us first, but I've read it a couple of times since and the story is entirely familiar to me. It's been quite a while, though, so I figured a full re-read was due before my parent-child book club discussed it next week. If you are unfamiliar with the story - several of my group hadn't even heard of it, much less read it - The Railway Children follows three children, Roberta, Peter, and Phyllis, who are relatively well-off, living in London with Mother and Father. Mother stays at home and cares for the kids (along with several servants; this is set around 1900, after all) and Father works for the government. The children really don't know hardship at all, and are sweet, clever, and kind. And yes, one might be forgiven for being concerned about whether or not we have a story yet, or whether the story we have might be unbearably boring. However, one day Father disappears without even a goodbye to the children after a late-night meeting with two strange men. He does not come back, and things get stranger and stranger. Servants are dismissed, Mother spends her days in important meetings and writing important letters, and then eventually the house is packed up and the family moves - without Father - to the country. But aside from missing their father, and being worried about their mother, the children are not unduly upset or put out, for their new house is very close to the railway. They have marvellous adventures, do good and even heroic deeds, and make friends of all the people they meet. 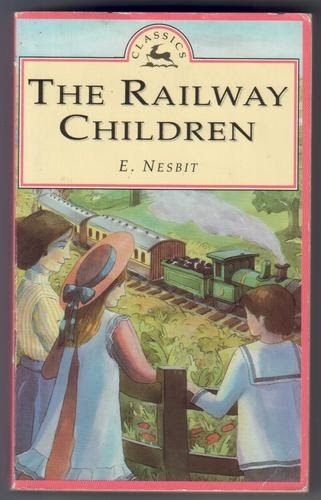 Nesbit writes the children with a tremendous amount of empathy, and the small concerns of childhood as well as the larger concerns the children have to deal with when times become more difficult are handled with equal respect. And the book is funny, too. The children are funny, their enthusiasm is catching, the situations they get into are exciting. Their chatter and banter is amusing and so creative, but not unbelievably so. Nesbit has a way with description that can make even the most banal scenes come alive, and she leaves quite a lot to the reader's own imagination in just the right ways. Yes, the children are slightly too good to be true, but they are not perfect. Nesbit gets right inside the head of a child, and explains their motives to the reader, often almost as if she is whispering conspiratorially in our ear. As the narrator of this book Nesbit is very chatty, regularly breaking out of the page to talk directly to us. It's part of what makes the book such a fantastic readaloud, and retains its charm for me as an adult. There are a few other things that do not retain their charm, so be aware: the book does show its age in certain aspects, particularly and most glaringly around gender roles, but also around other issues as well (poverty, which plays a large role in the lives of the children after they leave London, is treated with a very light hand, and there are a few references to "foreigners" I could have done without.) I think this will be a point of discussion at the meeting, framed around the gender issue. It becomes most obvious right near the end, when the doctor in the book takes Peter aside to have a discussion about the differences in temperament between men and women. This is glaring. It's also, I hope, so ridiculous in this day and age that the kids reading won't give it any credence. And if they are tempted to, I expect the adult they are reading with will have a few words. More problematic is the way boys are "supposed" to act, as evinced by a funny poem Mother writes for the childrens' friend Jim. Perhaps it was tongue in cheek, but the suggestion that a boy who is interested in reading and lessons over athletics and physical activities is somehow foolish and an appropriate target of ridicule by adults as well as children is unfortunate. And it comes across in all seriousness, and originates from Mother, who is a stable, wise, and clever character in the book. As a reflection of the prevailing attitudes of the time, it's an interesting exercise to read those sections of the book. My concern is that the prevailing attitudes about appropriate behaviours for boys haven't changed enough for kids to twig to the inappropriateness of the poem. Or even adults, frankly. So I will be curious to see what the kids in my group think about those things, and what the adults have to say, too. Overall, a highly entertaining little book, charming and fun, and not without its poignant moments, as I reference at the beginning. The characters are very distinct and very much themselves, and the plot rips right along at an impressive speed. Does make one long for that sort of countryside and the joyous, imaginative days of childhood, though the bits about gender at the end remind one not to get too nostalgic. Still, a recommended family read and a classic of children's literature for good reason.
" the suggestion that a boy who is interested in reading and lessons over athletics and physical activities is somehow foolish and an appropriate target of ridicule by adults as well as children is unfortunate." And especially worrisome because this attitude is alive and well today. But hopefully that makes it an interesting point for discussion? I haven't read this yet but really hope to read more Nesbit this year. She sounds like a charming writer despite all the troublesome Edwardian attitudes. I know what you mean, about the restating and clarifying, though I also meant to say that regarding the discussion, we didn't end up having one, to my dismay. The group is too small to withstand too many pressures, and we had a couple of illnesses and a pressing school project, and thus no one was able to come. And since we're doing The Higher Power of Lucky next meeting I don't think we'll have time to get to The Railway Children. Which is a shame, because I would have been curious to know what the boys in the group thought, vs. the girls, and how the parents of both thought about that poem too. Too bad. I was interested to hear how kids of today would react. I didn't take much notice of the outdated advice. When you read a book that old--stealing coal--I think you make allowances for how people thought in the past. But yeah, good to call a young reader's attention to the differences. Jeanne, I think that's just the thing - in my experience, adults tend to notice this stuff and find it interesting in context, even if it's a bit cringe-worthy. With the kids, I don't always know what they're going to think, or if they're going to notice it at all. I'm not sure how much of my cringing is the fact that as an adult I pay extra close attention to this stuff when I'm recommending a book to kids. I do think my tendency in these cases is to sometimes give the kids less credit than they deserve for intelligence and nuance. Almost every single time they surprise me.